Today we woke up at around eight in the morning and after eating breakfast we made our way to the Gallery Lafayette for some shopping. We had 2 hours to browse around all the high end designer shops which was awesome but also everything was pretty pricey. Then we went to the Champs Elysées Bolouvard where we had another 2 hours to get lunch and shop. Lots of girls came back with shopping bags from all different stores. 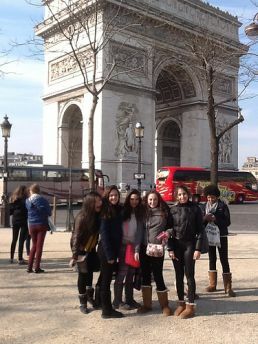 We met as group again and made our way to the Arc de Triumph to do our usual photo shoot. It was huge! Then we took a long walk to the Trocadaro for a quick view of the Eiffel Tower then down the hill to join the line to go up it. We went as a group to the 2nd level and some girls paid a little extra to go all the way to the top. After taking lots of photos we made our way back down to the base to meet the group. It was freezing!! Our fabulous dinner tonight was at a restaurant not too far away. After dinner we went back to see the Eiffel Tower lit up at night and took more photos. It was another amazing day in Paris but now we are extremely tired and are going to bed. Night!